There are a few things not covered in the video that I wanted to share with you if you want to make your own. When I think up these ideas it’s a learning process for me as I try to take the vision in my head and build it into a tangible item, there are always things that I learn and discover in the process, here are a few tips. 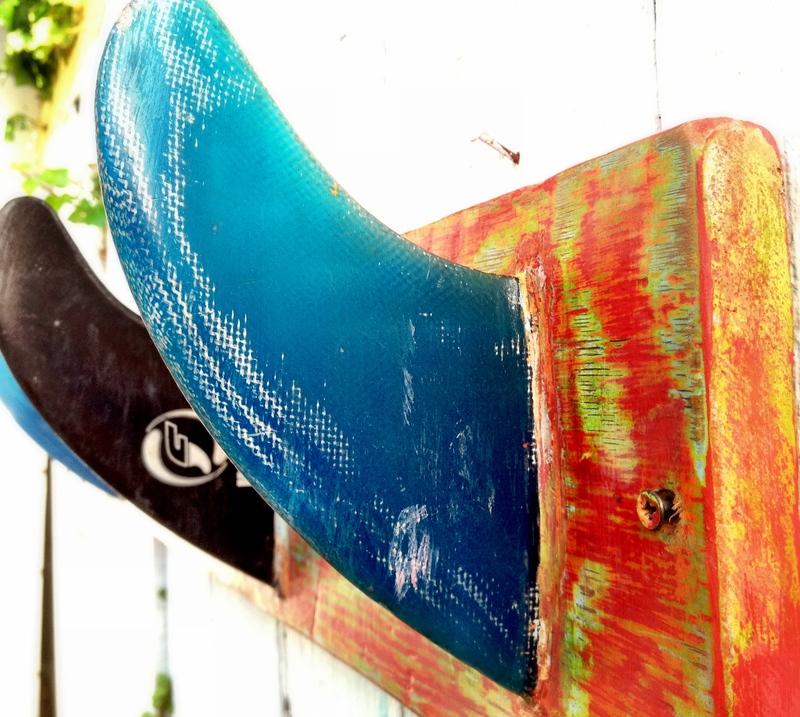 Some fins will easily pop out of the surfboard and others are glassed in. I used a variety of different types for this project. 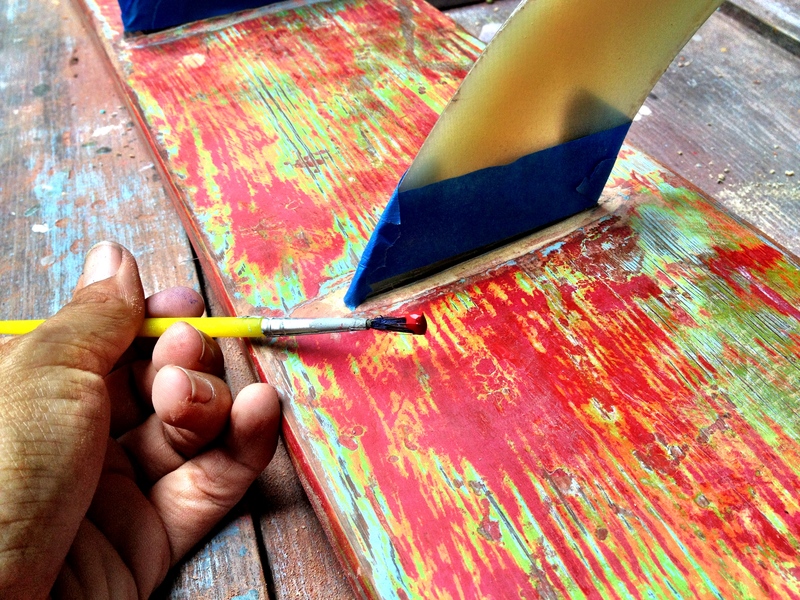 We sawed off the glassed in fins from my Recycled a surfboard into a chalkboard video. I borrowed a few from my friend Bobby as well. Bobby walks on the beach everyday and has found several fins that somehow escape and wash a shore! Each fin is a different size so you will want to lay out your design, measure and trace before cutting into the wood. We were new to using the router so the grooves we cut were a little bigger than they should have been. As you saw in the video we had to add some wood putty to fill in the gaps but if you cut your board precisely you won’t need to do this and your end result will be cleaner. Here you can see where I had to touch up some of the paint to cover the wood putty. I also did not tape off the fins in the beginning and spent some time chipping off wood putty and paint from the fins… duh Debi! 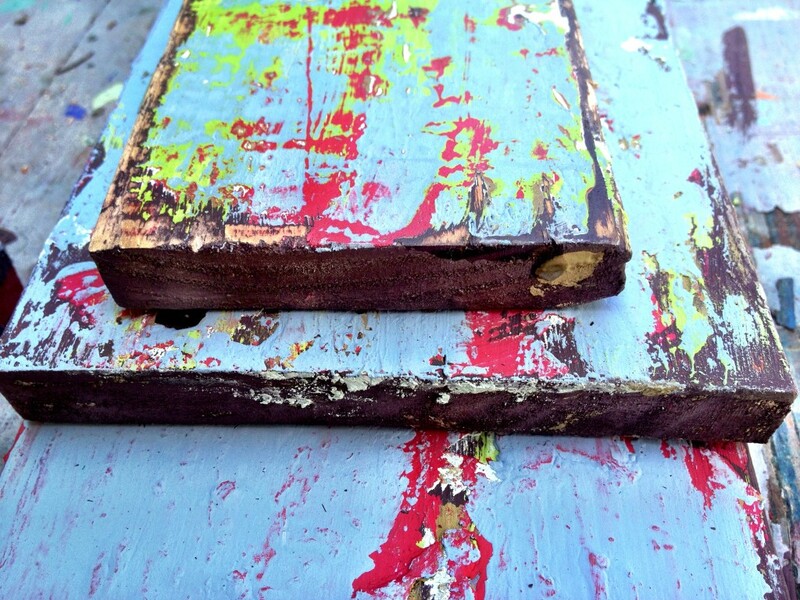 When it comes to creating a super weathered distressed finish I have a few more tips as well. Whatever you choose to distress, look for something that has lots of character in it, the more chippy distressed, uneven and dinged up the better! The board I chose for the coat rack had lots of texture and ripples in the wood, I absolutely love this and get really jazzed when I find something that looks like it’s been though a hurricane because I know the paint will come alive on it! Be sure to wait for each layer of paint to dry before painting the next color on, otherwise your color will blend and you will get a muddy look. CeCe Caldwell paint is perfect for this because it dries so fast. I have tried to distress with laytex paint and the results are disappointing. Laytex will not sand off easily and will peel away in big circular chunks, it ends up looking like someone ripped holes in your project. I highly recommend using wax and/or satin finish after sanding, the colors loose their sharpness with sanding because of the dust, when you apply the wax it literally comes alive. The satin finish will add even more shine and protect your finish. 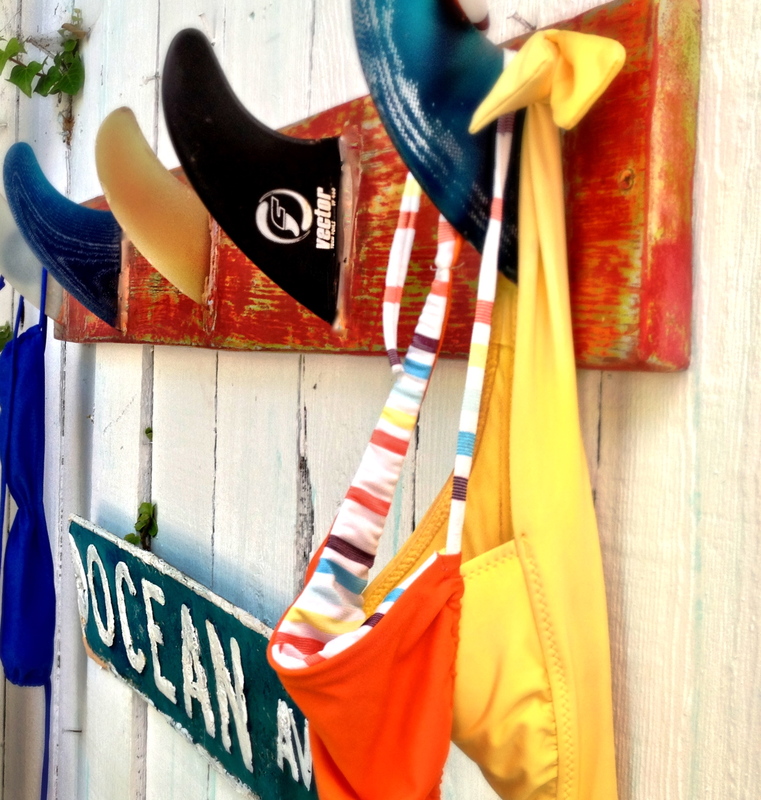 I am super excited with the results and I am giving this surf fin coat rack away! To enter the give away all you have to do is subscribe to my youtube channel Debi’s Design Diary on Youtube and leave a comment there telling me how you would use it, if you are the winner! You can earn extra entries by liking the CeCe Caldwell Facebook page or my Facebook Page. The lucky winner will be announced on Sept 30th! CeCe Caldwell paint is taking off like wild fire! There are so many talented dealers across the country who sell paint, teach workshops and sell beautiful painted furniture. I have listed just some of the retailers below, If you do not see what you are looking for, visit the CeCe Caldwell Facebook page and post on the wall what you need and you will get a quick response to your question. So here is a sample of where to find paint and take workshops this fall…I have included the links just scroll over the names of each one and click! Bungalow 47 in Williamsburg MI has fun variety of classes like this one! These fun gals have a painting 101 class coming in Sept with a few spots left! Shelly from A little Bit of Shizzle is also in MI and teaching a paint 101 class this September! This girl is a painting rockstar! If you don’t believe me check out the jaw dropping photos on her blog! Furniture Affair in Phoenix AZ has several fun painting classes and an amazing shop full of vintage treasures! The Vintage Dames in Carlisle PA. sell paint online and are always cooking up something beautiful. Laura Brewer from Studio Primrose will be teaching classes at Debra;s Cottage in Costa Mesa, CA as well as at Furniture Affaire in Phoenix this September! Doesn’t this classroom look like the most inspiring spot? Sign me up Laura! How about taking a paint class in the Wine Country! Anne Skougard will be teaching in Sonoma Ca this fall! Kim Biden from The Vintage Addict in Everette, WA sells paint and beautiful painted pieces at The spare Room Flea Market. Kathie Carter Scantlin from Gypsy Joe Peddlers in Huntsville Texas is fully stocked up and selling paint and furniture! If you are in B.C. Canada, Roxanne Murdoch and Noreen O’Dell’ from Welcome Home have a paint workshop coming up too! I am in love with Roxanne and Noreen’ s beautiful shop! Check out this photo of Ruth, I love a woman who’s not afraid to get after the junk! This buffet is so dreamy Janice! Jill Simmons Perlof is the north Georgia CeCe Caldwell retailer , you can find her shop, Weathered Pieces here. Donna Lambert Hale from Doozies Corner has seven locations in the state of Texas, you will definitely want to check her website she is stocked full of paint and has classes coming soon! Donna’s Chalkboard says it all! Jennifer Lane at Belle Patri in Jarrettesville MD has a demo class in September. Jennifers store is stocked full of furniture, please click over there are tons of photos there but for some resin my computer would not let me grab one. love this pretty white dresser, be sure to check her newsletter for her class schedule. Nicckol Buck of Vintage Dreaming sells paint at the Rusty Chandelier in St. Joe Mo. I love how she used this color, Carolina Sun Yellow! The Finishing Shop check her site she has a free paint demo next week! love the color combo on Melissa’s dresser! Be sure to check her page for upcoming classes! love Maria’s painted upholstery chair! Love her name and this yellow dresser! Allison has workshops scheduled all through the fall, looks like so much fun! This photo of Stacey’s is awesome on so many levels, I love the colors, the way she styled this and the cat is just killing me! Chris Williams of CSS consignment is in Ponca City OK.
Love his dreamy turquoise and black chair, reminds me of Alice in Wonderland! Leslie has a wonderful benefit paint workshop this month, to help Project H.O.P.E an organization that reaches out to Spokane’s Disadvantaged youth. You will get to meet CeCe herself at this workshop and learn from some of the best teachers in the industry! some of Leslie’s goods at Orphaned Decor. Ok well as I said these are just a few of the amazing retailers who sell and teach CeCe Paint. There are so many more! i can think of at least 20 more that are not mentioned here, you can find them by simply going to http://cececaldwells.com there is an official list of all of the paint retailers there. I am so impressed with the passion that these people have for paint. I am proud to be a CeCe retailer because, CeCe Caldwell paint is the best paint on the planet, If you try it you will understand the enthusiasm ! I didn’t want to be left out of all the fun so I am also putting together a class for October if you are near San Diego and would like to come paint with me, stay tuned I will announce the details next week! BTW I will be filming my class and dancing and having fun will be optional but mandatory! Awesome! Would love some paint! So many projects but no paint 🙁 Great idea for the coat rack, very cool! Thanks for sharing our shop here Debi! Keep making these FANTABULOUS videos, You ROCK! Anyone doing classes in UT? I would love to come!! This would look so great in my mermaid (coastal decor) home!